Sometimes he is asked to find where unwanted water is coming from, i.e. leaks from a trout lake, or seepage into someone’s cellar. On one memorable occasion he was asked to go and dowse near Birmingham, only to discover his client was Jasper Carrot. It was Peter who dowsed to find that the long-lost fifteenth-century Dursley Castle was undoubtedly built on what is now our recreation ground. Aided by architect John Wilkes, who used to write a column for the Gazette, Peter dowsed to find the castle walls, windows, the moat, and a drawbridge, but unusually, no portcullis. HIs findings were confirmed by a geophysical survey and old photographs, one of which appears in the book. Peter started his 34-year dowsing career as Chief Engineer on a Saudi Arabian airbase, where he often needed to locate underground cables beneath the shifting sands of the desert. He went on to include map dowsing; finding lost objects; detailed archaeological work; health and healing and, a special interest, clearing negative geopathic stress. HIs book includes stories about all those and more. 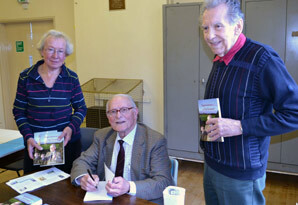 Slimbridge Dowsing Group members queue as Peter Golding signs copies of his new book, ‘Experiences of an Old Dowser’, at Slimbridge Village Hall on Thursday 12th April. Photo Patrick Callaghan. Quite by accident Peter started the local Slimbridge Dowsing Group in 2003, as a result of a talk he gave to the Slimbridge Local History Society about a labyrinth discovered by dowsing at nearby Troytown. He is proud to be Chairman of the group which now has almost 40 members.